The Japan International Cooperation Agency funds about 80% of the Mumbai to Ahmedabad project through a soft loan of Rs. 79,000 crore at an interest rate of 0.1 per cent, with a tenure stretching over 50 years and a moratorium period of 15 years. 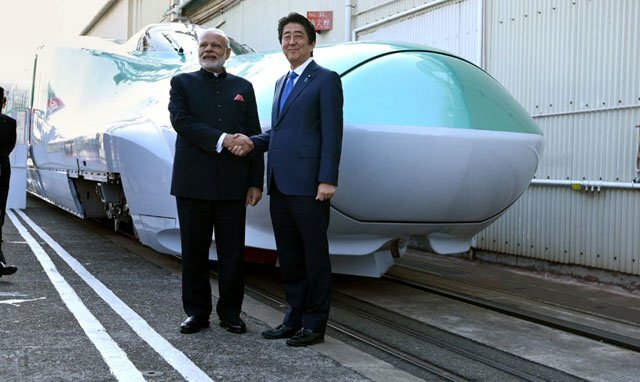 FUKUOKA, JAPAN: Japan’s Prime Minister Shinzo Abe on Friday said his country was committed to making the bullet train project in India a reality as soon as possible, PTI reported. The project is slated to cost Rs 1.1 lakh crore, of which the Japan International Cooperation Agency is slated to fund Rs 88,000 crore at an interest rate of 0.1%. The bullet train corridor from Mumbai to Ahmedabad is proposed to be an elevated 508-km high-speed rail line meant to benefit diamond merchants, textile traders and other professionals shuttling between the two cities. The Shinkansen high-speed bullet train, which India bought from Japan, will cover the distance in two hours. The project is expected to be completed in 10 years. Former Indian Foreign Secretary Subrahmanyam Jaishankar said urbanisation in India is similar to the story of Japan-India collaboration, The Straits Times reported. Japan first introduced small cars to India four decades ago, and the metro system two decades after that. “There are many firsts in the India-Japan story, both politically and economically,” he said.